INDIAN VILLAGERS don't just pick up any cow-pat they find. Even this lowly excrement, so prominently strewn around, is governed by a complex set of ownership rules in rural India, and is not to be collected and used by anybody. It all depends on local village rules, on who is looking after the cattle and where it is dropped. Dung is most commonly used as a domestic fuel or a natural fertiliser. Mixed with mud, it is used as building material for walls and thatches. Smeared on walls and floors or on the open ground outside houses, it offers protection from both water and dust. It is used for lighting hookahs, in making bamboo baskets, as an insect repellant and a disinfectant. Those who cannot afford firewood to cremate their dead use dung instead. Potters, goldsmiths, washerpersons and blacksmiths all use dung. Owenership pattern Traditionally, the right to dung is vested with the cattle-owner, but since cattle move around in search of fodder and water, these rights get distributed among different people. Dung ownership rights vary from region to region in India and are closely linked with the traditional practices and the cultural milieu of the rural area in question. The fact that all dung did not belong to the owner in many parts of India was first brought to the limelight by Devendra Kumar, ex-vice-chancellor of Gandhigram Rural University, Tamil Nadu, in an article in Science for Villages. Devendra Kumar's article referred, in particular, to villages in Madhya Pradesh and Maharashtra. The Centre for Science and Environment in New Delhi then took over, writing to several people all over the country to find out more about prevailing dung ownership patterns in villages. While it is true that it is the more affluent peasants who possess the largest number of animals, dung availability does not entirely depend on the ownership of land or livestock. According to Devendra Kumar, there are four primary kinds of ownership rights, though minor variations do exist here and there. 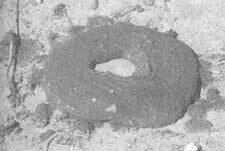 Dung produced in the premises of either the owner's house or farm belongs to the owner. Dung dropped on the way while the animals are taken out to graze belongs to the owner, if he or she accompanies the herd. If not, it can be collected by anybody. Droppings on the village commons belong to the gram panchayat which auctions it to the highest bidder on an annual basis. If the cattle graze on private lands, dung dropped there can be claimed by the owner of the land. If dung drops on temple land, as much of it as is used to cook prasad for devotees belongs to the priest. The rest of it is sold and the money goes into the temple's kitty. In some temples, dung is collected only when it has dried and then used as fuel during festivals. Droppings on grazing lands can be collected by anyone. In the Mewar region of Rajasthan, according to voluntary worker Ramachandra Sharma, the claimant places a large stone in the middle of the pile of dung, encircling it with smaller stones. In Gujarat, a stick left in the centre serves as a sign of ownership. Yet, according to Sharma, it is only when the cattle is unaccompanied by a herder that the dung is anybody's property. When agricultural activity is at a peak, that is while harvesting or sowing, the entire village hires a herder to look after cattle. Families that own a large number of animals also do this. During this period, the herdsman can claim all the droppings outside the cowshed. When a herder cannot be found to look after the cattle, each cattle-owning family looks after the animals in daily rotation. The family that looks after the animals gets that day's dung. In many villages, the dung is allowed to remain on the common grazing lands by mutual consent to allow it to act as a natural fertiliser and enhance the growth of grass and vegetation. According to Sharma, "By and large, the ownership rights of dung remains with the cattle-owner. It is only when the cattle moves about unaccompanied that these rights get distributed among other villagers." Social activist V Arivudai Nambi writes of a similar system in the villages of Tamil Nadu. Traditionally, the ooragali or herder tended the cattle of the entire village. In the last 15 years, this has got reduced to tending cattle belonging to 10-15 families at fixed wages and with the right to collect dung for selling as manure from the mandavalis or scrub jungles that are the major village commons in Tamil Nadu. Dung dropped on lesser grazing grounds like river banks, ponds and irrigation tanks are collected by the villagers. With the siltation of ponds and tanks, grazing grounds for cattle have been drastically reduced, forcing families to keep fewer numbers of animals which they tend themselves. Also, stall-feeding is more popular now than open grazing. Families with more animals hire young boys at fixed wages and a measure of paddy after the harvest. With dung disappearing as a common resource, the villagers' dependence on it as an energy source has also been reduced. That there have been significant changes in cowdung availability and its use is clearly shown by Madhu Sarin's study of two Punjab towns. In Banur, a potter's family pointed out that, 30 years ago, they were able to collect enough cowdung for their requirements from the surrounding forests where the cattle grazed. Today, the cattle is stall-fed and the dung is jealously guarded by their owners for use as fuel and fertilisers. Limited droppings en route to the cattle ponds are collected by the persons tending the cattle. The increased commercialisation of dung can be seen in the steep rise in its market value in Banur. Thirty years ago, dung cakes were for free. Ten years ago, a sackful could be bought for less than Rs 2. Today, a sackful costs Rs 8 in the market. Among those most affected are potters who use cowdung cakes for baking their wares. Sarin says, "Thirty years ago, the potters could collect as much dung as they needed for free. Today, a cartload costs them Rs 40 to Rs 50. One cartload can bake barely 20-30 pitchers. So, their economic foundations have been severely shaken. Availability is also uncertain because landowners are reluctant to sell their dung. Of the 20 potter families in Banur, only two are still continuing with their traditional occupation amidst extreme poverty." That potters should face this marginalisation is ironic as traditionally, they used to have the first rights of ownersship over cowdung from community lands and forests. The Tholkappiam, a Tamil treatise written way back before Christ mentions this anecdote: "Due to heavy floods some dead buffaloes were washed ashore near a village situated on the banks of a river. A dispute arose among the villagers as to who should clear the carcasses. The village karnan (official who maintained tax records), when asked to settle the dispute, consulted his tax records and discovered that the potter's family had defaulted on their dues. So he said that the potter should remove the carcasses because they it is who collect dried cowdung from the forest to bake their pots. The smoke thus generated rises to the sky to descend as rain. Hence, the potter was responsible for causing the floods." The traditional rights of potters over dung are still known to exist in some villages of Tamil Nadu. Potters use dung cakes for baking their pots and pitchers which need fuel for six to seven hours at temperatures as high as 800 C.
The deputy director of the Delhi Crafts Museum, N K Pal, says, "In Uttar Pradesh, Bihar and West Bengal, almost all the dung used by potters is purchased from herders belonging to the scheduled castes who collect and sell dung cakes. With the advent of biogas plants, which can be built by households with the droppings of three or more cattleheads, it has to be ensured that the village poor are not deprived of the dung which they had hitherto collected free. To a lesser or greater extent, dung collection is still subject to the traditional practices of cattle-grazing in the country -- its access being fairly uniform among different economic classes. Banwarilal Choudhari from Hoshangabad says, "The ownership problem of cowdung will not arise so much from the installation of gobar gas plants as from the breakdown of a village society -- its traditional customs, its social structure and its cultural and agricultural practices." ---This survey was conducted by Anil Agarwal and his colleagues at the Centre for Science and Environment.